Discussion in 'Company Information and PR' started by Great In Grass, Jan 9, 2015. Alfalfa is one of the few perennial (3-5 years) highly drought tolerance forage crops. 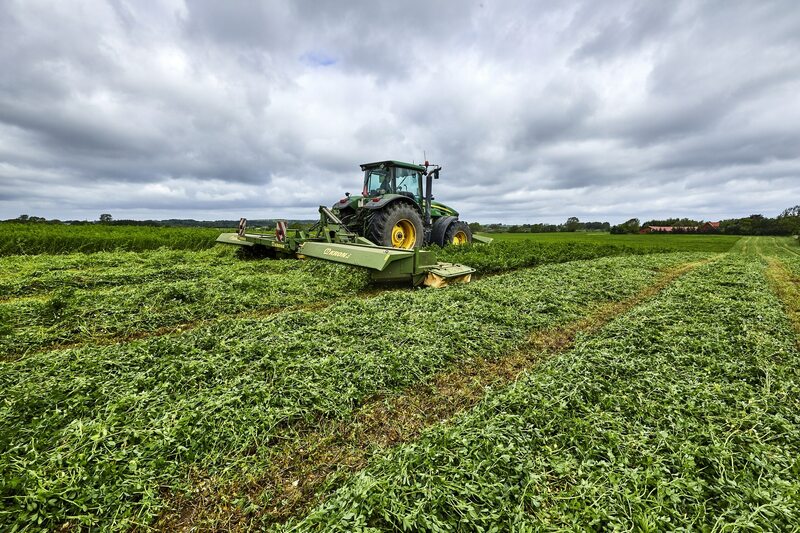 When the going gets tough for most forages under drought – alfalfa keeps going. 2018 brought strong attention to crops, which keep producing under drought alleviating the economic impact of forage deficit. Plant breeding has increased focus on protein content and yield in many species. Increased interest for homegrown protein (autonomy), care about soil structure and soil microbiome, warning signs of more frequent summer drought, are all factors leading to more interest of alfalfa outside the traditional growing areas. Notwithstanding the observed negative correlation between dry matter yield and protein content in legume breeding, alfalfa breeders have managed to make progress for both traits = Increased protein yield per ha and increased protein per feeding unit. Alfalfa protein yield per ha even surpasses that of soybean. Most alfalfa seeds are now proposed pre-inoculated with nitrogen-fixing bacteria, ready for drilling without additional operations or costs. The harvest window, which is the optimum time for cutting alfalfa, has been extended through breeding for lodging tolerance. The extra days/week can make the difference. Alfalfa can be sown with narrow row spacing to increase competition with weeds or with wider row spacing for easier mechanical weed control. The huge improvement in soil structure and the fixated nitrogen release to the following crops (progressively over three years) makes alfalfa a great companion inorganic farming. The deep alfalfa roots are the explanation of many of the superior traits of alfalfa. 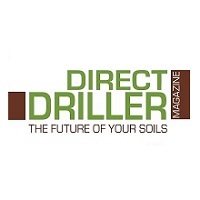 The deep rooting ensures survival when water becomes scarce in the upper soil layers and contributes to the persistency. Our company has increased focus on roots and rooting via the root screening facility RadiMax, where scientist can monitor and identify breeding lines with the highest rooting potential. 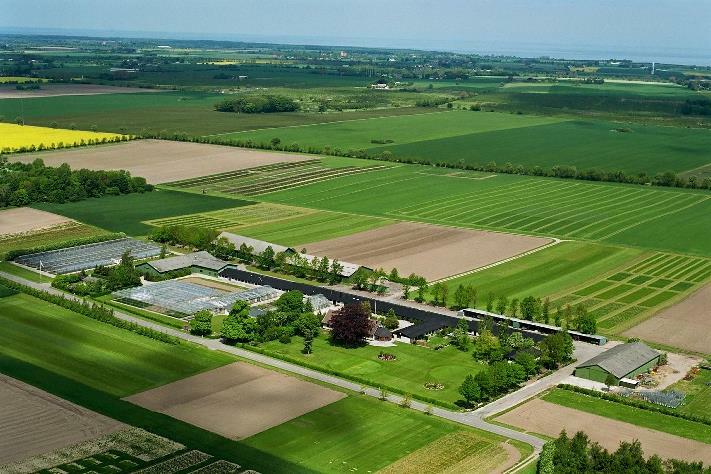 Together with University researchers and other industrial partners, DLF is actively participating in projects aiming at isolating grass- and legume-based proteins for monogastric animals. The first results are very promising, showing both high yields of extractable proteins as well as fibre pulp fractions with even higher feed intake in dairy cows than traditionally conserved forage. DLF has developed a substantial breeding program in hybrid festulolium that has produced a unique range of hybrid festulolium varieties. After initial hybridization and subsequent selection on the hybrid progeny or back crossing the hybrid progeny to its parental lines, a wide range of varieties with varying characteristics and phenotypes has been created. Tall fescue PLUS is a hybrid tall fescue developed by crossing Meadow Fescue (Festuca pratense) or Tall Fescue (Festuca arundinacea) with perennial ryegrass (Lolium perenne) or Italian ryegrass (Lolium multiflorum). 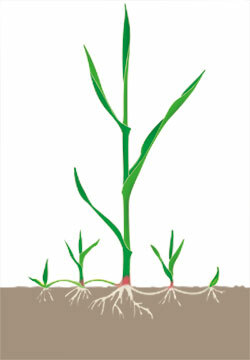 There are two types of hybrid grasses; Ryegrass PLUS and Tall fescus PLUS and both types belong to the species festulolium. Morphologically, these varieties resemble italian ryegrass but with a persistency of up to four years. This type is suitable for both cutting and grazing. Maximise lamb performance this summer by grazing Stubble Turnips. Would you like to grow a crop that can produce over 80 tonnes of palatable feed per hectare? Bombardier Kale has a high protein content and doesn’t lose its D-Value too quickly, so it can be grazed from September to February and is suitable to be grown anywhere in the UK. If you used to grow kale, or have never grown it before, now might be the right time to give it a go! 2481kg beef worth *11p/kg = £7792. 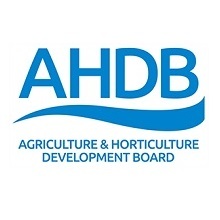 In 2017, AHDB estimated the average yield of grass in the UK to be 7.9t DM/ha. Comparing seed sales to the temporary and permanent grass area in the UK, the UK reseeding rate stands somewhere between 2 and 4% per year meaning we are more likely to drop in overall grass production than gain. A list of our Stubble Turnip varieties available for the coming year. Appin: A grazing turnip which is mostly leaf, with a leaf to root ratio of 80/20. Suitable for multi grazing. Barabas: High leaf to bulb ratio resulting in high levels of protein. Fast Growing catch crop which is very suitable for grazing. 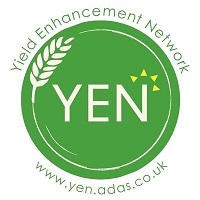 Flexible sowing period with very good early vigour, UK Proven, highly palatable with good disease resistance, Quick to mature. Barkant: A winter hardy, a highly digestible variety with high dry matter. Produces large tankard shaped roots which are palatable by both sheep and cattle. This is a proven and reliable stubble turnip. Delilah: Delilah is ideal for finishing lambs and will produce huge, white tankard shaped bulbs. Good resistance to mildew. Samson: Can produce huge, tankard-shaped purple bulbs which are very palatable to both sheep and cattle. 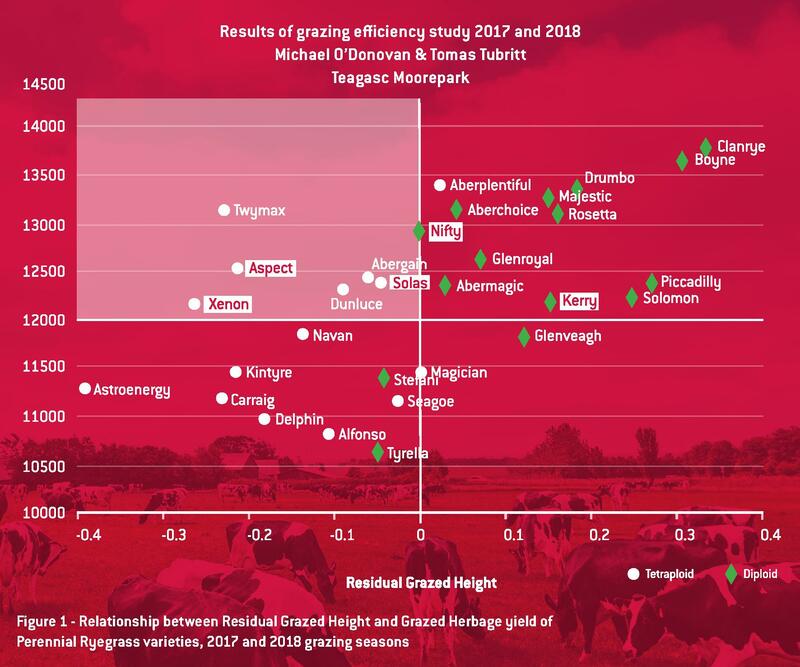 In trials, Samson has shown to be preferentially grazed which can lead to higher intake and live weight gains. Rondo: Rondo is a green-skinned variety, suitable for sheep or cattle. It has a very leafy growth habit with excellent disease resistance and can be utilised from September to early February. Rondo has excellent root anchorage which helps reduce wastage in the field. Vollenda: A large-leafed, highly digestible variety with good early vigour and good disease resistance. It retains its palatability throughout the season, and is noted for its yield speed of growth and bolting resistance. 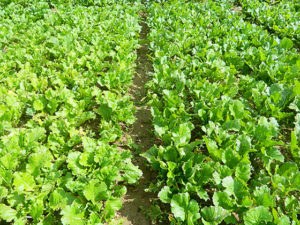 Skyfall (Hybrid Brassica) New! Skyfall is a new Hybrid brassica, bred to provide a palatable leafy feed which can be fed either in the summer, when grass growth might be limited, or sown later, to enable the crop to be grazed in the autumn or winter months. Skyfall’s hybrid ability enables regrowth potential and the possibility of producing extra feed. Tyfon (Hybrid Turnip): Tyfon is ideally sown in the spring and utilised in the summer months when grass growth generally declines. Tyfon should not be sown too early as it is susceptible to bolting. Tyfon’s growth habit is very leafy with regrowth potential. Is the appin turnip suitable to mix with IRG? 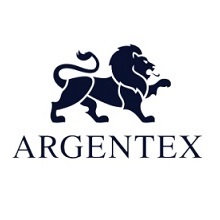 Yes, because of its rapid growth it is able to compete with the IRG. 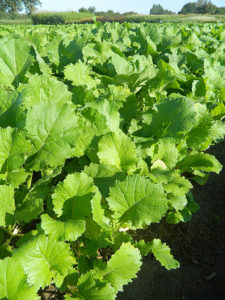 "Avalon" is another variety of leafy turnip we offer. What rate would you suggest? 10kg mix, 9kg IRG with 1kg leafy turnip any greater amount of turnips would probably smother the grass. Is it possible to order this from you? CUT & GRAZE produces top quality silage with the option to graze. It's a long-term, persistent, highly flexible mixture with clover. Countryside Seeds are pleased to offer the complete range of Game Maize mixtures from DLF. Game Maize is still one of the most popular crops used for cover and feed.